The Concrete Rheometer BT2 is a compact rheometer for fresh concrete. Opposite to the spread table method the BT2 concrete rheometer tests the concrete at various loads. Therefore the relative yield-stress and relative viscosity can be determined. The unique design of the BT2 Concrete rheometer avoids structural breakdown and segregation during measuring. The BT2 is a small, powerful stand alone and easy to use equipment. Fill fresh concrete in the specimen container. Switch on the BT2, at this moment the force sensors are automatically calibrated. Set the BT2 on the shaft in the middle of the container. Turn the wheel by hand until the BT2 has turned one round. The data are now stable and stored in the BT2. Up to 35 datasets can be stored in BT2. After the test you can transfer the data via the infrared (IRDA) interface to a Palm handheld computer which is included in the standard scope of supply. A sample of test material is placed in a sample container. The BT2 is fixed in the middle of the container and turned one round by hand. The internal processor monitors the measuring data i.e. The momentum on the three probes and the angular velocity. On completion of the measurement the readings may be wireless transferred and displayed to an external Palmtop. 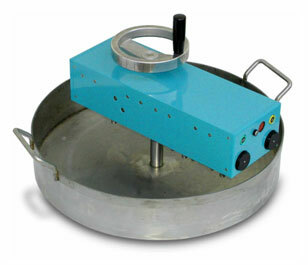 Most rheometers measures the shear stress at various speed while the probe rotates several times in the test container. With the BT2 you will get three speeds at the same time, one convolution is enough. You will never measure in the same place two times. The system is driven by hand, and all the electronic is power independent. The ideal instrument specially designed for the building site.